New Delhi, Oct 23 (IANS) The Congress on Monday demanded a court-monitored probe into allegations by a Patidar leader from North Gujarat that he was paid Rs 1 crore to join the BJP. Congress spokesperson Manish Tewari said Narendra Patel, who belongs to the Patidar Anamat Andolan Samiti (PAAS) led by Hardik Patel, had said that the BJP attempted “to purchase him for Rs 1 crore and Rs 10 lakh was paid in advance”. Tewari said the allegations of bribery were “very serious” and said Narendra Patel had said Gujarat BJP President Jitubhai Vaghani was the culprit. “It calls for reaction from the Prime Minister and the BJP President. It calls for registration of FIR against the Gujarat BJP. It calls for investigation under a sitting judge of the Gujarat High Court. If this is not checked, the sanctity of the election process in Gujarat in times to come will be questioned,” Tewari said. He said it was incumbent on Prime Minister Narendra Modi to investigate the allegations as these were being levelled against his own party leaders. Tewari also accused the BJP of trying to “break” people-led movements opposed to BJP rule in Gujarat. “Why is the BJP trying to coerce, lure, allegedly bribe the leaders of this movement and trying to break it? Isn’t this a clear sign of their frustration? Isn’t this a clear manifestation of their demoralisation?” he asked. Tewari said another Patel leader, Nikhil Sawani, had quit the BJP within days of joining it. He said “allegations of bribery” were also levelled by Congress MLAs during the Rajya Sabha election earlier this year. 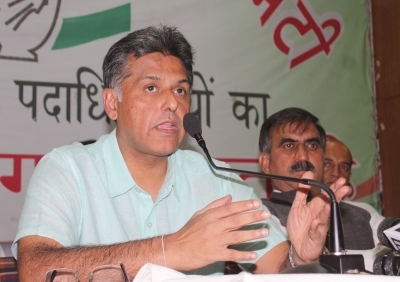 Tewari said the truth prevailed in the end and the BJP lost the Rajya Sabha poll.